A girl introduced in volume 3, Alice is a trainee for Orange Planet, a company who currently holds the first place in the water guide business. She first appears as a very standoffish, snotty young girl; however, exposure to Akari's mood begins to lighten her up as the series progresses. This does not stop her from telling the other girls to be quiet when they argue, however. She is just a trainee when Akari and Aika are apprentices, but is already showing a talent for rowing that might surpass both of them (in fact, this is the reason why she was scouted by Orange Planet despite her age). Despite this (and the fact that Akari and Aika are from rival businesses), she often joins the two in joint practice sessions, and she sincerely enjoys their company. Alice speaks in a very deadpan manner, and tends to use the word dekkai (でっかい - meaning "huge") often in the course of speaking. Aika also commonly addresses her as "Kohai-chan" (後輩ちゃん - or "junior" said in a friendly manner). Of the three girls, Alice is actually the first to become a prima, efficiently sidestepping the single/journeyman status and earning herself the nickname "Orange Princess" (as seen above.) 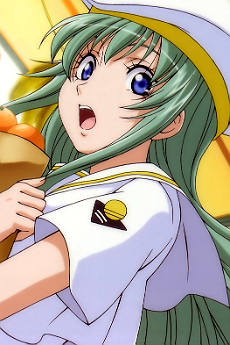 Alice not becoming a single might be because she was going to school, and because Orange Planet didn't want to burden her with the addition of potentially being able to take on customers when accompanied by a Prima, as she arguably had the talent to become a single even before she met Akari and Aika. (Since the single test is basically rowing up the canal to the Hill of Hope.